We make t-shirt pricing simple. Order 100 tees as priced above and save on our already low prices. These premium quality cotton tees are a year-round essential. This is our best-selling t-shirt and has been voted "most popular" by groups, teams, clubs and schools across America. They are made from 5.4-ounce, 100% soft cotton and are available in 45 different colors. Heather and neons are 50/50 blend. We print your logo and/or message on the front and/or back. Sizes: Adult Small to X-Large. Minimal up-charge for sizes to 4X. Front Imprint: One color imprint up to 12" x 12" or 9" x 12.75" in size. Back Imprint: One color imprint up to 12" x 12" or 9" x 12.75" in size. 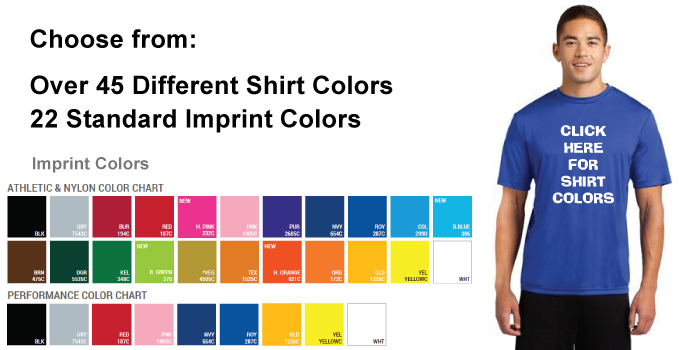 Pick a fabric color(s) - Yes, you can order more than one fabric color as long as you use the same ink on all goods. Prepare your design(s) - Logo must be supplied by you. 15 min. design time included, covers most jobs. One of the most common mistakes customers make is submitting low resolution artwork. This can result in a blurry image on you shirt. We can make your artwork high resolution for you if necessary. Please review our artwork information here. If you need help making your artwork top quality, please give us a call at 866.LOGO.LOGO. Free Shipping and basic set-up on all orders. Our pricing is based on receiving your logo in acceptable digital format. Please review our artwork information here. If you need help making your artwork top quality, please give us a call at 866.LOGO.LOGO. The following prices apply to most orders placed by customers. It includes positioning your logo and adding appropriate text. Your price may be slightly more if design services are needed. Please call us at 866.LOGO.LOGO to discuss your needs. Pricing for standard order sizes are below. Order Soft Comfort Cotton Tees today by calling us at 1.866.LOGO.LOGO.